Master Rigan Machado is a living legend in the world of Brazilian Jiu-Jitsu and is considered by many to be the greatest grappler to ever walk the face of the planet.Master Rigan holds the prestigious Red and Black Belt and is nephew of the Legendary Grandmaster Carlos Gracie. Master Rigan Machado achieved his legendary stature at the world championship level by amassing a record like never been seen again. From the age of 14 through 21, he won the World Championships every year and every belt division. He amassed a record of 365 wins and no losses in Brazilian Jiu-Jitsu competition. He also created a record by having 19 matches in one day and finishing all of them by submission. He has also competed and won in other styles of grappling such as Sambo in which he took 2nd place in the World Championships. He remains unbeaten in Brazilian Jiu-Jitsu in more than 13 years of competition. Master Rigan Machado is one of the most unique and interesting people in the martial of Brazilian Jiu-Jitsu because of the desire he has to bring the best out of all his students. He has taken pride in the fact that he will always be a student of the art and he will always make sure that his students receive the best from him at all time. Mark Massey was first introduced to Brazilian Jiu-Jitsu in 1993 after visiting Professor Pedro Sauer's academy in Salt Lake City, UT. He trained off an on for about 2 years but had to move to Washington and took up Judo before earning any colored belt rank in Brazilian Jiu-Jitsu. Mr. Massey continued regular study and training in Judo, earning his Shodan (Black Belt) in 2001 and Nidan (2nd degree Black Belt) in 2008 under the United States Judo Association. In 1999 Mr. Massey took up Brazilian Jiu-Jitsu again and continued the journey he started several years earlier. Mr. Massey earned his Blue Belt under Professor Keith Owen (Pedro Sauer) in 2005, his Purple Belt under Master Carlos Gracie Jr. (Gracie Barra) in 2007 and his Brown Belt under Professor Rafael Ellwanger and Master Carlos Gracie Jr. (Gracie Barra) in 2009. After 6 years with the Gracie Barra Team, Mr. Massey elected to part ways and find a more suitable, non-franchised organization for the Academy. 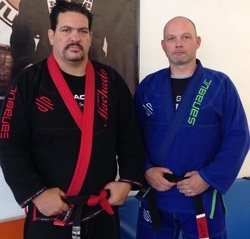 After months of research and phone calls, Mr. Massey was put in touch with Master Rigan Machado, who graciously took the School and Mr. Massey under his tutelage and guidance. Mark Massey was awarded the coveted Black Belt from Master Rigan Machado directly on May 25, 2013, and was selected by Master Rigan to become the Rigan Machado BJJ Association Director, helping unite the Rigan Machado schools worldwide and standardize a curriculum based on Master Rigan Machado's teachings and principles. Professor Massey was again promoted to 1st degree Black Belt by Rigan Machado on October 8, 2016 and proudly represents Rigan Machado Jiu-Jitsu and the Association here in Southeast Idaho. After more than 20 years of sharing his grappling knowledge and passion with others, Professor Massey is considered the "Godfather" of Jiu-Jitsu here in Pocatello and is also the highest ranking BJJ BlacK Belt Instructor. Professor Massey has trained and promoted most of the Pocatello and surrounding area BJJ School Owners and Coaches, helping establish a highly skilled BJJ community in SE Idaho. Members of EJJA and EJJA Alumni are current or former IBJJF Champions, Junior Olympic Gold Medalists, National Judo Medalists, multiple time State and Regional BJJ and Judo Champions, as well as multiple time State, Regional, and Division Wrestling Champions. We are an Academy focused on the development of Self-Defense, Self-Improvement, Self-Empowerment, Self-Discipline, Honor, Integrity, Loyalty, Teamwork, Courage, and Commitment. Elite Jiu-Jitsu Academy has the best Kids Program for effective anti-bullying, as well as weekly character building assignments which develops not only their skills, but their mind and bodies for optimal physical and mental health.